I had a hankering for chocolate chip cookies a few weeks back, so I started with my Google Reader, and searched for recipes. I have hundreds of chocolate chip cookie recipes bookmarked. That can be kind of daunting. Instead, I turned to a Chera, a friend of mine who is an awesome cook and baker, and asked her if she had a favorite recipe for them. These were fantastic. 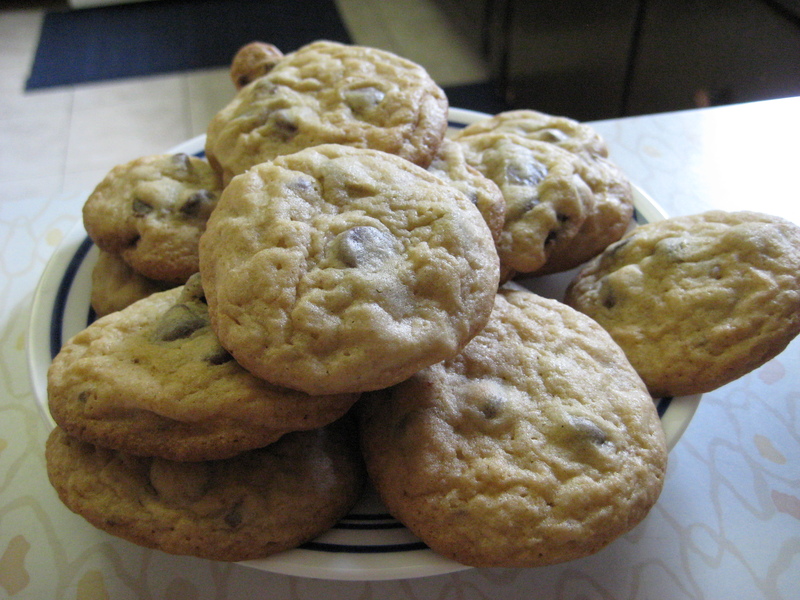 A very simple chocolate chip cookie, but delicious. 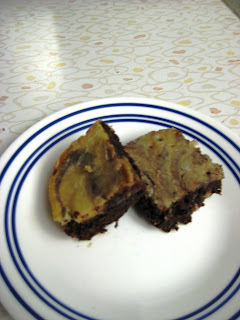 You can use any chocolate chip you prefer in them — I just happened to have a bag of semi-sweet on hand so I used those. Chera prefers them with milk chocolate chips, and I think they’d be divine with dark chocolate as well. 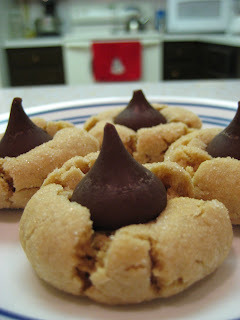 – Drop 1 tablespoon of dough per cookie onto ungreased cookie sheets. – Bake at 375ºF for 9 to 11 minutes or until golden brown. If I pack on any weight over the holidays, it will be a direct result of these pesky little buggers. 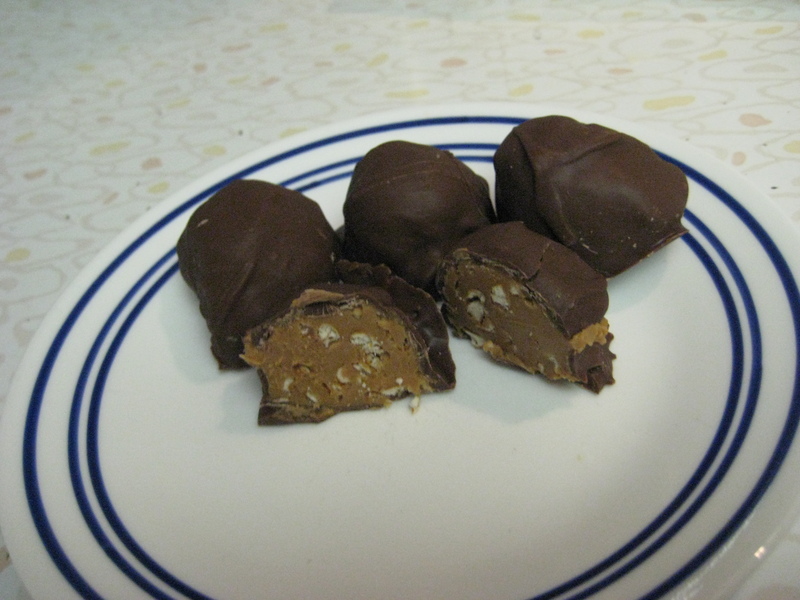 – I kept mine in the freezer for awhile, and now they’re sitting on my cold, enclosed porch. Make sure you keep them chilled — they’re better that way! 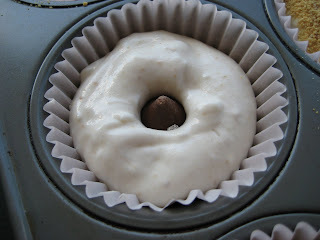 These are delicious (assuming you like irish cream!)! I made them as a test batch for a St Patty’s day luncheon we’re having at work — wanted to make sure they were, err, “suitable” for work, while still containing booze! They most certainly are — delicious! – Mix in flour, baking powder and salt. Mix in chocolate mixture and extracts. Stir in chocolate chips. – Using tip of knife, gently swirl through batter, forming marble design. 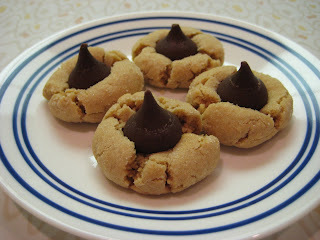 These tasty little cookies will definately satisfy your chocolate-tooth! They’re very easy to put together, and there’s just something incredibly satisfying about squishing that Hershey’s Kiss into the hot cookie fresh from the oven! – Heat oven to 375°F. – Remove wrappers from chocolates. – Beat shortening and peanut butter in large bowl until well blended. Add 1/3 cup granulated sugar and brown sugar; beat until fluffy. Add egg, milk and vanilla; beat well. – Stir together flour, baking soda and salt; gradually beat into peanut butter mixture. 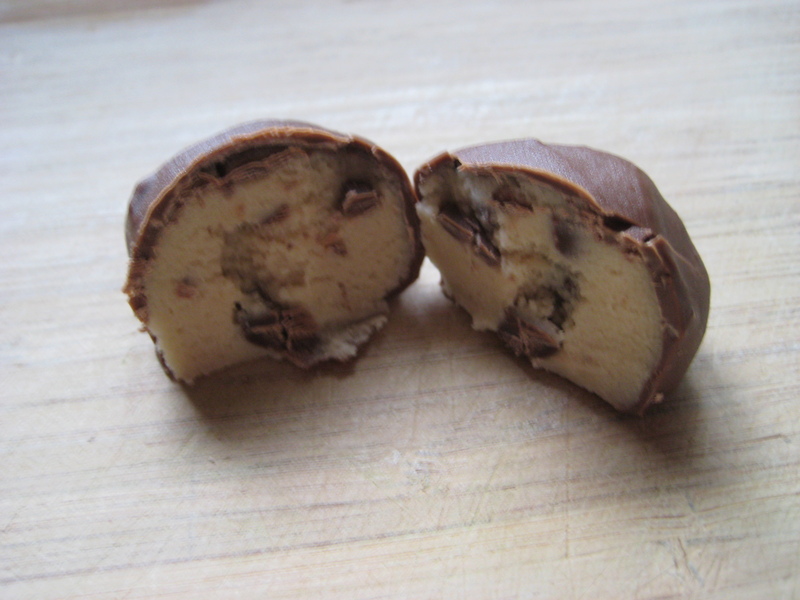 – Shape dough into 1-inch balls. Roll in granulated sugar; place on ungreased cookie sheet. – Bake 8 to 10 minutes or until lightly browned. 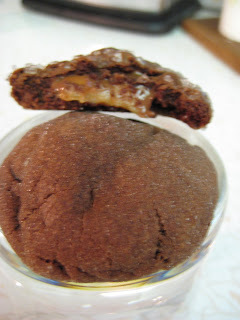 – Immediately press a chocolate into center of each cookie; cookie will crack around edges. – Remove from cookie sheet to wire rack. Cool completely. *This recipe says it makes 4 dozen — but I got more like 3 dozen. 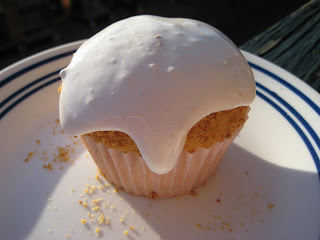 First, I have no idea why these are “Sunshine” S’mores Cupcakes. For me, they’re just S’mores Cupcakes. 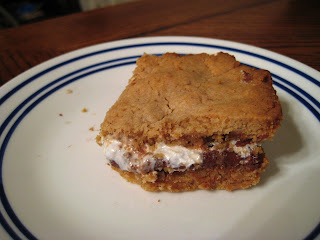 I made these because I had 1/2 jar of Marshmallow Creme left from making S’mores Bars. These were pretty good, but not nearly as good as the Bars! – These are WAY BETTER warm, so if you have leftovers, just pop them in the microwave for 10 seconds to heat everything up again. This recipe has made the rounds on many of the blogs — and with good reason! 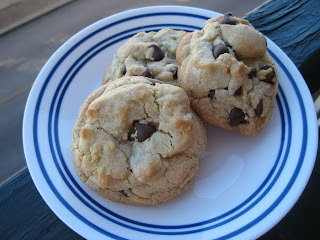 It’s a very delicious, chewy, chocolate chip cookie recipe. Unfortunately, I was just a tad disappointed. It had all of the qualities I was looking for in a chewy chocolate chip cookie..but it just didn’t quite DO it for me. 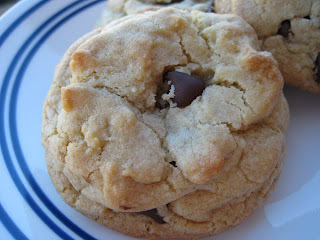 Does anyone else have an amazing chewy chocolate chip cookie recipe out there for me to try?? The key to these cookies are the melted butter and extra egg yolk, which allows them to stay chewy. Oversized baking sheets (commercial size) will allow you to get all of the cookies in the oven at the same time. But if you only have standard sized cookie sheets you’ll want to bake them in batches. It is also important to let these cookies cool on the baking sheets. – Adjust the oven racks to the upper and lower-middle positions and preheat the oven to 325 degrees F.
– Cool the cookies on the sheets, then remove cooled cookies from the baking sheets with a spatula. I swore I wouldn’t bake. I swore I wouldn’t make anything “picnic” or “get-together”-worthy this weekend. I told myself it was because DH and I didn’t have any plans…and because we’ve both been carrying an extra 3-4 pounds lately that won’t budge. But that was really only half of it. On some level, it was my rebellion against living far away from my family (who always gets together for holidays in some form) and living near my in-laws (who never celebrate holidays, it seems). It was my rebellion against my tiny 1-bedroom apartment on the third floor of a building that doesn’t allow grills. My rebellion against a kitchen that makes a sailboat galley look enourmous. My rebellion against being able to celebrate the 4th of July outside, in the country — no sounds but the animals and friends and family laughing, and the crackle of a bonfire that we’d roast marshmallows on later. And I was doing pretty well. Until this. S’mores bars? Could it be??? Could it be that I could have a s’mores this weekend? Sure, it wouldn’t be charred — but it has to be better than a microwaved s’more, right?! With renewed hope, I flew to the store, bought the three things I didn’t have (graham crackers, chocolate, and marshmallow fluff — all the actual s’mores pieces), and promptly made these. – Scatter bits of the remaining dough over the marshmallow; carefully press to form a layer (I think next time I might try to gently roll out this half of the dough and lay it over the creme…that would make my top layer more even and smooth) **Make sure you really press this down — I had some trouble with my top layer separating from the fluff.